Do you often feel bloated? When was the last time you did number 2? If you frequently experience stomach discomfort and distress, you should do something about it right away. Why is it important to take care of your gut? The state of your gut has a major influence on how your body functions. It can affect you physically and mentally. If your gut is happy, your brain is able to do its job easier. If your gut is healthy, your mood is much better. If your gut is at its best, your bodily systems work without hitch. With a gut that is well taken care of, you can live your life to the fullest — enjoy as many hobbies as you want, build strong and lasting relationships, and achieve your dreams and goals. There is nothing to limit or stop you from putting yourself out there and making the most out of your life. What should you do to have a healthy gut? Whole grains are rich in fiber, so consuming a lot of them can promote regular bowel movements. Moreover, they are abundant in minerals, such as selenium, iron, and magnesium, and B vitamins, which contribute to better overall health. They not only reduce constipation, they also help lower blood cholesterol and risk of heart disease. 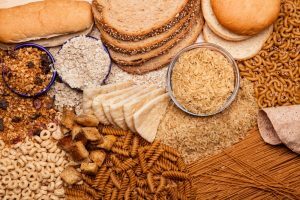 A serving of some highly recommended whole grains, such as brown rice, barley, and buckwheat, per meal per day should do wonders to your gut. Made by fermenting milk, yogurt is a dairy product that is popularly consumed by itself or as an ingredient in other dishes. It is rich in calcium, which plays an integral role in ensuring that you develop healthy bones and teeth; minerals, such as phosphorus, potassium, and magnesium, which are necessary for great metabolism and blood pressure regulation; and vitamin D, which boosts the immune system. For best results, stick to plain and unsweetened yogurt, as the other varieties, like the full-fat ones, may contain sugar and other less healthy ingredients. Did you know that a single banana is mostly made up of carbohydrates and water, and only has about 100 calories? In addition, it is rich in fiber that helps reduce constipation, and antioxidants that help regulate blood sugar levels. For these reasons, it is often included in meal plans for people wanting to lose weight or needing healthier digestive systems. Furthermore, because it also contains lots of potassium and magnesium, it promotes better overall health, and lowers risk of kidney problems, high blood pressure, diabetes, and heart diseases. When exercising, it is also used as a preventative measure against soreness and muscle cramps. Mushrooms are quite nutritious, with lots fiber, protein, antioxidants, and B vitamins. They are an excellent prebiotic food, meaning they can provide nourishment for the good bacteria that live in your stomach. And, because they contain very little fat and few calories, they can help in losing weight, lowering cholesterol and blood pressure levels, and keeping you away from diabetes. It is best if you include mushrooms on your daily meal plan. There are several different organic mushrooms you can easily get at supermarkets, such as shiitake, white, and Portobello, so you can choose a different one everyday to add variety to your dishes. Popular in Asia, miso is a type of fermented food that is incredibly nutritious and healthy. It is made by fermenting soybeans with koji and salt. It contains a probiotic strain called oryzae that eliminates symptoms of inflammatory bowel disease, or IBD, and other digestive problems; and reduces bloating, gas, diarrhea, and constipation. The best way to incorporate miso to your diet is to add it as something like a flavoring ingredient to your usual dishes. It can be used to enhance the tastes of soups, marinades, salad dressings, and stir fried meats; and as an alternative to soy sauce, salt, and other seasonings. A good source of B vitamins and fiber, legumes are a common food that is great for your stomach. They help stop you from passing gas at inopportune times by improving your gut flora. And, because they are also rich in protein, they are a perfect replacement for chicken, pork, and beef, if you decide to go the vegetarian route. 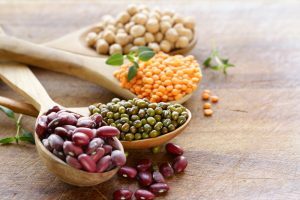 Every meal, you can prepare a side dish, soup, salad, or stew made with chickpeas, kidney beans, lentils, black beans, or other legumes of your choice; or eat them as they are. Available at stores in different forms, almonds are a popular type of nut that offers amazing health benefits. They are high in fiber, protein, monounsaturated fats, magnesium, and manganese, which aid in boosting overall digestive health. Moreover, it has antioxidants and vitamin E that protect you from cancer, Alzheimer’s disease, heart disease, diabetes, high blood pressure, and cholesterol problems. It also reduces the feelings of hunger, making you eat less, and, thus, can lead to faster weight loss. Almonds are often sold raw or roasted, or are used to make milk, butter, paste, or flour. They are commonly used as an ingredient in salads, breads, cakes, smoothies, and more. Known for their sweet and juicy flavor, raspberries are among the most commonly consumed berries in the world. They have an abundance of powerful antioxidants and fiber that help boost gut health. They also contain a lot of water, and can prevent constipation and promote regular bowel movement. With the other vitamins and minerals present in them, they are able to lower the risk of diabetes, obesity, heart disease, and cancer; and improve eyesight, weight management, and energy levels. Raspberries can be consumed fresh, or added to salads, smoothies, sauces, and baked goods.